Today I'm Featuring Camera Obscura. I'm not sure why I like this band so much, but for me there's just some undeniable appeal to the music that puts my mind into some kind of nostalgic mood that I seem to enjoy. 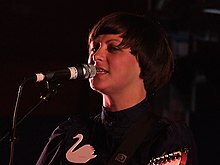 Camera Obscura were formed in 1996 by Tracyanne Campbell, John Henderson, and Gavin Dunbar. Several other members performed with the band before David Skirving joined as a permanent guitarist. The band's first releases were the singles "Park and Ride" and "Your Sound" in 1998. The band's line-up changed in 2000 and 2001 when Lee Thompson joined as its permanent drummer, Lindsay Boyd joined as a keyboard player, and Skirving left and was replaced by Kenny McKeeve. The band's second album, Underachievers Please Try Harder, was released in 2003 and was followed by Camera Obscura's first full tour of Britain and Ireland and the band's first tour of the United States. Founding member John Henderson left Camera Obscura following this tour. In early 2004 the band recorded the songs "I Love My Jean" and "Red, Red Rose" following their third Peel session, in which Peel had asked them to put these poems by Robert Burns to music. Camera Obscura recorded their third album, Let's Get Out of This Country, in Sweden during 2005. The album was produced by Jari Haapalainen and was released on June 6, 2006. The title song was featured in episode 5 of the Friday Night Lights (TV Series). The first single, "Lloyd, I'm Ready to Be Heartbroken", is a response to Lloyd Cole and the Commotions' song "Are You Ready to Be Heartbroken?". In November 2008, the band announced that they had completed recording the follow-up to Let's Get Out of This Country, and in February 2009, they announced that they had signed to 4AD. The new album, My Maudlin Career, was released in April 2009, and preceded by the first single "French Navy". London jewellery brand Tatty Devine created Brooches and Necklaces to coincide with the launch. Around this time, the band announced that "due to family commitments (including being a proud dad) Nigel will no longer be a full time member of Camera Obscura". On April 18, 2009 Camera Obscura released a special edition Record Store Day 7” called, French Navy for independent record stores.